Ankle length pants are high waisted in order to provide truncal support and full abdominal coverage. "WONDERFUL for women who have Lipoedema"
I see everyone here buys these for cellulite. I'm here to tell you they are WONDERFUL for women who have Lipoedema, an adipose disease that causes pain and column-like legs, and can also be in your arms. I wear the pant leggings and the arm sleeves and love, love, love them. They help with the pain and to help move the lymph fluid, which does not move well with Lipoedema. "Impact on Fluid Movement in my Legs...Remarkable"
I agree with the other reviewers here in regards to the look and effectiveness of the leggings for smoothing purposes. However, I have to say that I use these leggings to help with the effects of Lymphedema. For more than 2 years now I have dealt with the pain, numbing, and swelling that comes with this condition. I purchased this product with the hopes that it would bring me some relief, and I have not been disappointed. The compression level is just right - not uncomfortable at all - and the impact it has made on fluid movement in my legs has been remarkable. "Just for Us with the condition of Lymphedema/Lipedema"
I am soo glad that these garments are available. 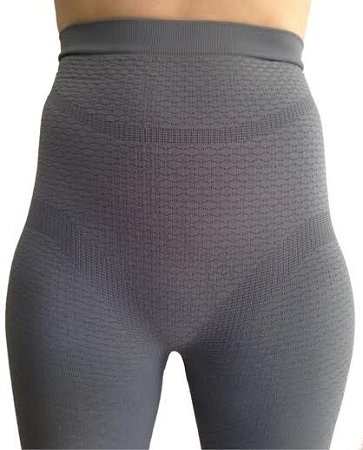 I have been using just spandex garments after I sort of discovered that I have LIPEDEMA. I did a lot of research as I live in a rural community and this is not a typical problem. I get online often to see if there is any new treatment or therapy I can try. I purchased one pair of bioflect long pants and LOVE them. Getting them on takes time but is well worth it. I also love the way they come up high on my midriff for added support. They do not wiggle down as the spandex often would, so they stay in place. I have already ordered two more pair. Thank you so much for finally producing a garment just for us with the condition of LYMPHEDEMA/LIPEDEMA!!! I cannot believe how comfortable these garments are. I am not constantly adjusting them and they are not nearly as hot as my other compression. They are also thick enough to wear as a legging. These are the only compression I will buy from now on. I am definitely a Plus Size, have lymph edema and these Capri's from Bioflect are the BOMB!! I got so tired of trying to find them on my own in stores. One day on the internet, I got lucky and happened up on these and I am a happy Camper. The material is superior and made to last. Very comfortable and easier to put on than others that do not have this quality. Customer service is great and patient with you if you have any questions. I bought one pair and have since bought two more! These are extremely comfortable for all day, every day wear. Very affordable as well. I give these pants a five star, I have tried multiple brands and sizes of compression the XXL fit my 4'10 220 pound frame great with lymphedema/lipedema Wish this product was around sooner! Love them! after a long day on my feet i put the leggings on and feel relieved quickly.